there is a certain two year old in our home that will greet me in the morning with a sleepy, “make crepes, momma?” several times a week. it’s hard to resist, but this recipe (especially if made the night before) is super easy to throw together and equally as easy to clean up after. depending on the toppings, they are also fancy and filling enough for a family brunch or breakfast for dinner! Mix melted butter, milk, eggs and salt in the blender. Blend until just combined but not whipped. Add the flour and blend until fully combined. Refrigerate for 10 minutes to 24 hours. Before using, consistency should be that of thick egg nog. Add milk if too thick, flour if too thin. Use an 8″ or 10” nonstick fry pan or a crepe pan. Heat pan on medium high and lightly spray with non-stick cooking spray. With large ladel, add ¼ cup batter and swirl around to make an even coating of batter on the bottom of the pan. Cook for about one minute, until edges start to pull away from the pan. Carefully flip crepe by sliding thin spatula underneath. Cook on the other side until lightly golden. 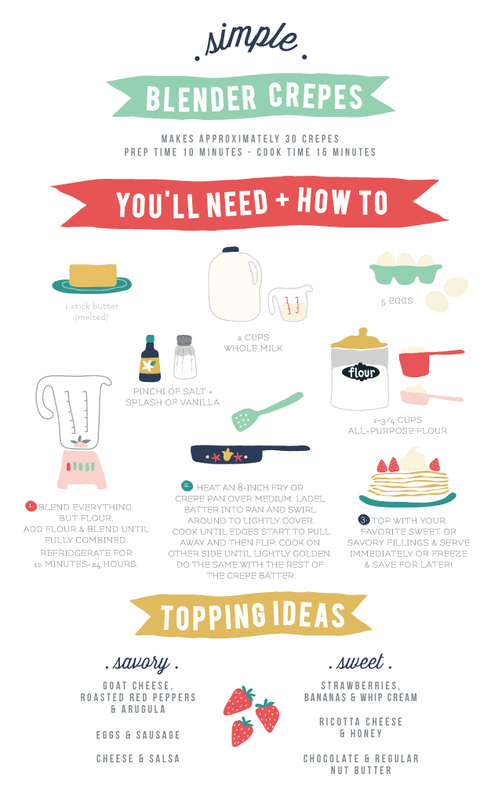 Do the same with remaining batter, stacking crepes on a plate as they are ready. Layer leftovers between parchment paper and freeze in a ziploc bag for extra busy mornings or snack time! * This crepe recipe can be made the night before and stored in the refrigerator for up to 24 hours. baseball posters + we’re moving!